Rolf Heuer, the Director General of CERN, gave a talk on the Large Hadron Collider at the weekly physics colloqium at Harvard this week. The talk, “The Large Hadron Collider: Entering a New Era of Fundamental Science“, was aimed primarily at undergraduates and postgraduates in the physics department and it certainly lived up to expectation. What struck me most was the speaker’s emphasis on the link between the world of the sub-atomic and the universe at large. From the very first slide, Prof Heuer explained the symbiosis between particle physics, astrophysics and cosmology, pointing out that the Standard Model of particle physics addresses just 5% of the the universe (since it is now thought that dark matter and dark energy make up the rest). This theme came up many times and is indicative of how much has changed in the world of particle physics in the last few decades. Another major theme was how the individual detectors overlap and complement one another, giving a result that is greater than the sum of its parts. The big news is that due to its excellent performance to date, the LHC is to run through until the end of 2012 (and not to go into a long technical upgrade at the end of 2011 as perviously planned). This means there will be enough data collected (albeit at 7 TeV) that some exciting new physics may have been discovered by 2013. This is very good news for particle physics, given that the Tevatron is due to cease operations in September. Heuer also introduced a historical perspective, pointing out that this year is the centenary of the Rutherford’s discovery of the atomic nucleus, the first public announcement of this I’ve heard so far. There was also a reference to the fact that 2011 is also the centenary of the discovery of superconductivity, without which the LHC would not be possible (superconducting materials are used in the giant magnets that guide the proton beams in the LHC). On the experiments, I particularly liked that he payed special attention to the LHCb experiment; although it is on a much smaller scale than ATLAS and ALICE, this is my favourite of the four detectors, because of the connection with antimatter (LHCb will seek to answer why matter predominates in our universe by probing the asymmetry between matter and antimatter decay in beauty quarks, see website here or a nice blogpost on it here). It is also the only major CERN experiment that has an Irish connection, see here. 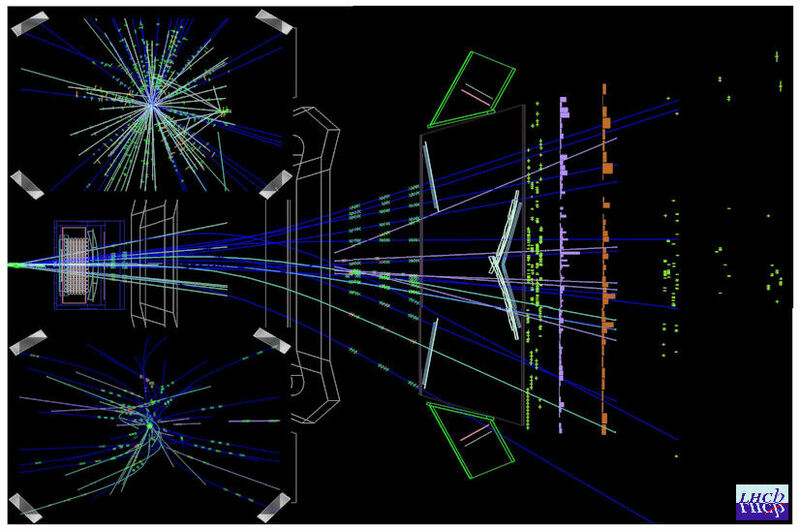 Event display of a pp collision in the LHCb detector producing two b-hadrons. At question time afterward, questions were deftly handled, with clear and succinct answers. I asked a question on dark energy; what did Prof Heuer have in mind when he said he hoped that LHC experiments could shed light on dark energy? His answer was that if the Higgs boson is found, it will be the first scalar boson observed (the W and Z bosons are vector bosons). Hence the idea of a scalar field, required by cosmologists for dark energy, while not the same field, becomes more tangible. On string theory, he declined to dismiss the theory as philosophy (as suggested by someone in the audience), pointing out that the detection of supersymmetric particles at the LHC could offer some support for ST.
All in all, it was a great talk, pitched at exactly the right level for students and really conveying the excitement of discovery. I was slightly surprised the speaker didn’t call more attention to the international aspect of CERN, that an inter-european project involving a motley collection of sparring nations has emerged as the world’s premier centre for experimental particle physics (perhaps he was being polite). Just as the detectors complement one another and offer a result that is greater than the sum of its parts, so can genuine co-operation of individual nations working in harmony (and all the more reason for Ireland to join, as I have said many times in public and in the press). 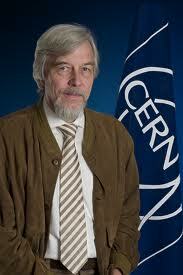 Wouldn’t you love to sit down for an afternoon with Rolf Heuer and casually chat with him about what he really thinks they will find at CERN? Great guy, sounded like a great talk. Thanks for an interesting article Cormac. Yes, he seems very grounded. I liked the way he paid great attention to LHCb, the smallest of the collaborations.. Thanks for the detailed comments. It sounds like Heuer’s talk had some real intellectual content. Sometimes talks from directors can be mainly lab publicity which, if you already know the lab, is tedious. I hope Harvard post his slides soon. Did anyone ask him about his opinion of the Fermilab program? Or of hints of new physics from CDF? Article very technique but the LHC experiment is great but i think i didn’t understand all the techniques about elementary particle.